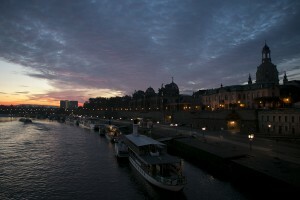 On my last day in Dresden, I hit the bricks early to experience the city waking up. Trams rolled down nearly-empty streets as the sun emerged from behind majestic buildings. After snapping photos for a while, I found a park bench overlooking the Elbe River and watched the day begin. Guided by the map I’d picked up at my hostel, I tracked down a shadowy remnant of Dresden’s Socialist past. Do you suppose this used to be called Leningrad Strasse? 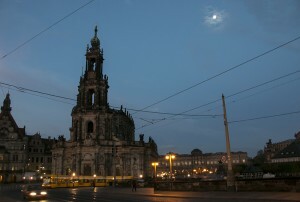 Some other images from my Dresden wanderings. At night, I finally got around to exploring the more modern area of downtown and found shopping, shopping, and shopping. And the obligatory wacky-shaped movie theater. 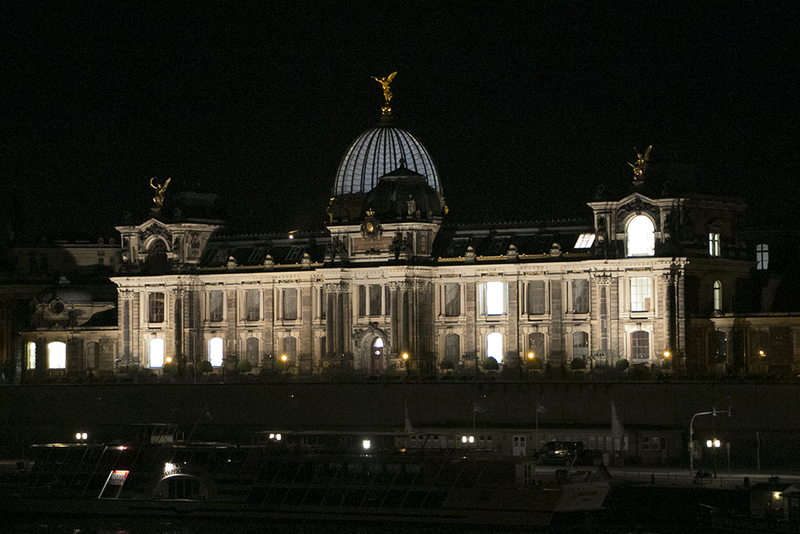 One last glimpse of the Academy of Fine Arts on the Altstadt side of the river. 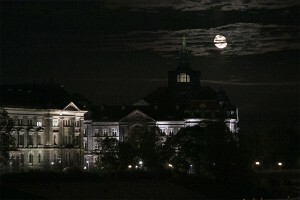 On the Neustadt side, a Tim Burton moon looms overhead. 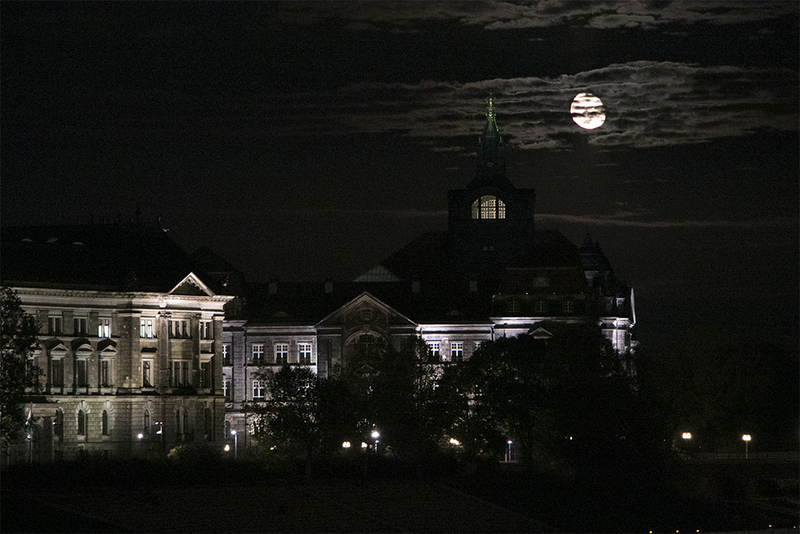 You know, the kind of moon that wouldn’t be out of place in The Nightmare Before Christmas. 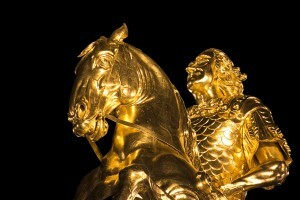 Each night, walking back to my hostel, I’d pass a statue of a golden rider. That’s Dresden’s golden boy, August the Strong, Elector of Saxony, King of Poland, and- most importantly to me- patron of the arts. 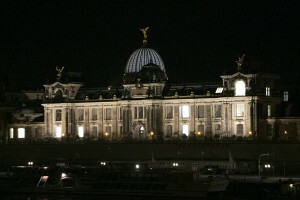 He attracted to Dresden the artists and architects who created the impressive buildings I’ve been ogling this week. This entry was posted in Uncategorized on February 22, 2014 by Ken.